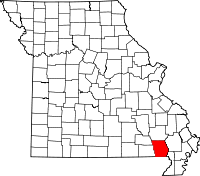 Located in southeast Missouri, Butler County is also in the southeast of the Ozark Foothills, a well known area that has a large number of resorts and outdoors areas. The county seat of Butler is Poplar Bluff, which is where individuals will find the Butler County Health Department, the local office in charge of recording births and deaths and distributing certified copies of certificates to those qualified, the Recorder of Deeds, the department which manages property and divorce records, and the Circuit Clerk, who is in charge of maintaining marriage records. Both the Recorder's and Circuit Clerk's offices are in the Butler County Courthouse on 100 N. Main, and the Health Department is at 1619 N. Main, all of them in Poplar Bluff. The Recorder has marriage records stretching from 1878 to 1921, and property records from 1850 to 1899, while the Health Department's vital records begin in 1910.